You know the old saying, “If you don’t like the West Texas weather, just wait a minute, it will change” is really true. This was totally apparent in one of our recent outdoor weddings near Lubbock. We had 60 mile per hour winds, then rain and by mid-afternoon, the sun was shining and the skies were clear. The best thing to do is to be as prepared as possible, and just roll with it. We have included a list of things to help you handle what Mother Nature may throw your way at an outdoor wedding in West Texas. In this three-part series, we cover wind, seasons, decor, and so much more. Stay tuned for tips on having a great outdoor wedding in West Texas. 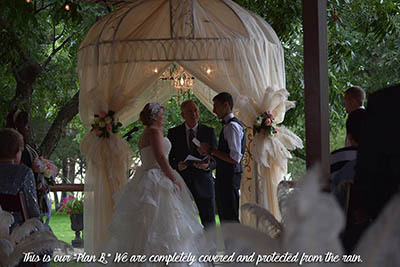 This week’s tips are about handling wind, bugs, and rain at your West Texas outdoor wedding. The first thing I think about with West Texas is our glorious wind. Yuck! 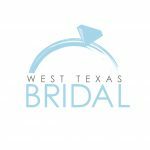 Choose an outdoor wedding venue in West Texas with a wind block. We all know how strong our West Texas winds can be, so something as simple as a tree strip or building to block the wind can be a real wedding saver. Consider purchasing tablecloth weights as well. Wow, are these ever worth the money. They simply clip to the bottom of the tablecloth. They are available in many shapes and colors and can blend seamlessly if desired. At Walnut Tree Weddings, we handle the wind concerns for you. My next concern for West Texas outdoor weddings would have to be bugs. Have mosquito spray on hand for your guests to use. Dryer sheets work well also, and they don’t leave a greasy, smelly residue. Dryer sheets can be rubbed on the skin, and then carried in a pocket. Use fresh Rosemary on your catering tables to repel flies and bugs. They are not only pretty but also fragrant, and work in well with most décor. Have a backup plan for outside wedding venues. Storms can come up very quickly in West Texas. Plan, Plan, Plan. Oh yes, did I mention, Plan? Don’t wait until the week or even day of the wedding to think about bad weather options. Plan out months in advance what you will do in the event of bad weather and share your contingency plan with your guests and vendors. A prepared bride is a stress-free bride. Consider hiring a bus or van to drive guests to and from your wedding venue if the weather turns bad. Pulling your guests out of rain filled ditches is not a great wedding pleaser. Next week we will cover three more topics for a successful outdoor West Texas wedding: heat, seasons and temperature changes. Stay tuned.